Earplugs are one of the most neglected pieces of gear. We all need them, but when they don't fit perfectly, or they don't sound good enough, we cast them into a drawer... much to the dismay of our ears. Having tried countless brands of earplugs myself over the years, I went on a quest to find which pairs I would actually wear. When it comes to musicians and earplugs, the biggest challenge is reducing sound evenly. Most plugs simply muffle the high-end, which is as good as useless when you’re on stage and carefully monitoring your tone. Over the years, many brands have sought to craft the perfect “musicians” earplug that reduces frequencies evenly: Hearos, Etymonic, and Eargasm among them. However, in my and many other musician’s experience, the high end is still too dampened, and the fit too uncomfortable. We ultimately chuck them away and continue playing shows unprotected. Enter Earasers. Their customer reviews are full of users who switched from other brands, finding Earasers to have the most realistic, high definition sound. Even the negative reviewers agree the sound is almost perfectly flat, and the fit is very comfortable. They mostly took issue with the overall sound reduction being too low (more on this later). What’s unique about the Earasers is that they ditch the 3-tiered cone design that so many other specialty plugs use. Instead, there’s a single silicone cup with a filter inside. While I’m no expert on the physics, this unique approach seems to do the job better than the alternatives. The cup makes a tight seal within your ear canal, and the filter apparently does the trick attenuating frequencies more evenly. While Earasers reduce sound more evenly, they reduce less sound overall compared to other plugs. This is the main user critique: it can still be too loud in a particularly noisy environment -- say, at the shooting range, or behind a drum kit. In fact, on paper, Earasers are rated as only reducing 5 dB, compared to 16 dB for Eargasm plugs and 32 dB for foam plugs. However, these ratings are very conservative, based on somebody who may wear them incorrectly and/or not have a proper fit. Under proper conditions, Earasers should reduce 12 - 19 dB, which is more average. They block way more sound overall. With a noise reduction rating of 32 dB, you could fall asleep at a Metallica concert wearing these. They are inexpensive. 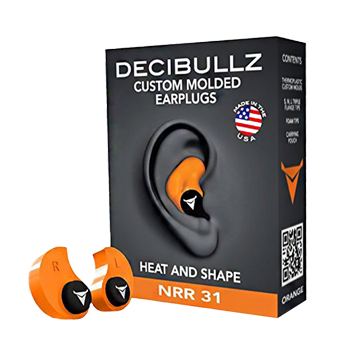 You can get hundreds of pairs for the same price as 1 set of specialty ear plugs. They are flexible. Anybody can figure out how to wear them, and they won’t cause too much discomfort. Again, by nature, foam plugs aren't going to sound as nice as specialty models. The sound will feel "muffled" with bass frequencies louder than the treble. Howard Leights may perform better than other foam plugs, but they're still not in the same ballpark as Earasers or Eargasms. Still, for 1/100th the price of specialty plugs, it can be tough to pass this one up. A close runner up for the best earplugs, Eargasms block a little more sound than the Earasers. They're also praised for their "flat" sound, although I don't think they perform quite as well as Earasers. ~$35/pair.